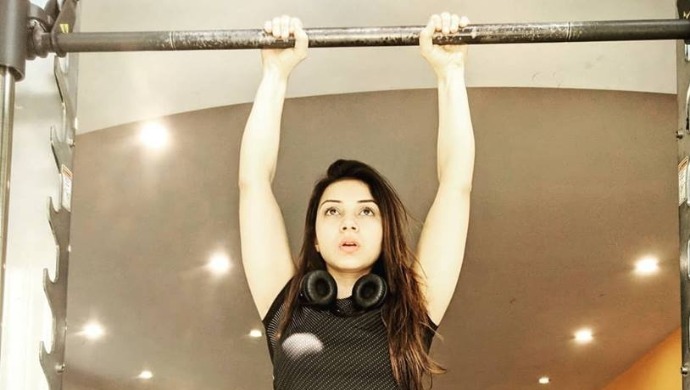 The actress plays Lakshmi Jindal on the show and spends her free time killing it in the gym! Sehrish Ali plays Lakshmi Jindal on Guddan Tumse Na Ho Payega, married to Akshat Jindal’s son Vardhan. Her character is seen as a scheming one, where she supports Durga’s evil ways. While Sehrish spends most of her time in busy shooting schedules, she uses her free time to kill in the gym! Watch her performance in an episode from the show here. Aside from being a fashionista, Sehrish is a fitness freak and likes to do functional training. Check out this post where the actress shows off her muscles! In this picture below, we see Sehrish showing us her goofy side, while indulging in some weight training. The actress likes to maintain a balance between cardio and functional training. Check out how Sehrish cycles like boss! If you too want a body like hers, it’s important to do weights and cardio both. Most people stick to doing only weights, thinking that it helps bring shape to the body. However, cardio is important to burn the excess fat. Going by Sehrish’s posts, it’s evident that the actress loves to workout. Notice her captions and see how she encourages her fans to hit the gym and keep going as well. Now that’s what we call a true star! With the stressful lifestyles that we lead today, it’s important to squeeze in some exercise. It’s not necessary to stick to gymming, you could also practice Yoga or play a sport. So, are you ready to break a sweat like Sehrish? Tell us the form of exercise you like the most in the comments section below. Guddan Tumse Na Ho Payega is now streaming on ZEE5. Catch all the episodes here! Shahid Kapoor And Kareena Kapoor Khan's Love Story In Jab We Met Will Make You Believe In Happily Ever Afters!